They are a terrific group to work with and got us some fabulous shots of WATTO buckles with Motley Crue, Godsmack, Drowning Pool, Theory of a Deadman and Charm City Devils. To see which band members chose which buckle, check out our facebook page. http://www.facebook.com/album.php?aid=308124&id=191510025176&ref=mf. The band members were so awesome to take such rockin photos with our product. Bevin Hamilton,one of Motley Crue’s dancers loved the buckles and ordered several more from us. We are waiting for pics from her. She was quoted as saying, “What I love about WATTO buckles is that they have taken creative metal work and made them so each one is unique. They are so rock and roll and I can’t wait to wear one at my next gig!” She’s such a doll! Crue Fest 2 was a big success for everyone. 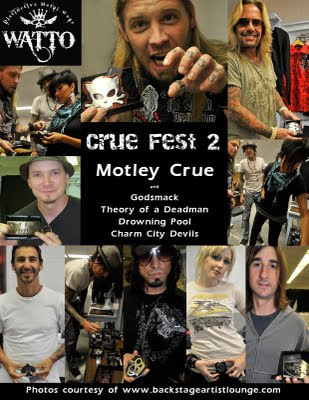 We look forward to sponsoring one of the shows of Crue Fest 3 in 2010.